Kaspersky Internet Security 2012 and Kaspersky Antivirus 2012 are the latest version of Kaspersky Anti-virus software. Kaspersky Internet Security 2012 is an all-in-one security suite which has been designed to deliver premium protection from viruses, Trojans, spam, hackers and etc. While Kaspersky Internet Security 2012 intends to provide complete security protection, Kaspersky Antivirus 2012 acts as the backbone of the PC’s security system that able to provide real-time protection against the latest malware and viruses. Both the latest version of Kaspersky Internet Security 2012 and Kaspersky Anti-Virus 2012 has included lot of new features, enhancements and improvements such as redesigned interface. Completely redesigned interface – Makes navigating around security settings inside Kaspersky Internet Security 2012 quick and easy. Kaspersky URL Advisor – Marks web links with a color-coded tag that shows their danger level and allows user to choose whether to open them. Kaspersky File Advisor – Checks file safety with a single click of the mouse. System Watcher – Monitors suspicious application activities and allows user to roll back system changes made by malware. Application Control – Restricts program access to personal data and system files according to the level of danger that each program presents. Safe Run Mode – Lets user launch suspicious applications and websites in a special, isolated environment where they cannot harm their computer. Two-way personal firewall – Protects against hacker attacks. Anti-Phishing and Anti-Spam technology – Provides reliable protection for user personal information and guards against unwanted spam and adware. Parental Control – Provides flexible and effective settings to keep children extra-safe when they use computers and the Internet. Completely redesigned interface – Makes navigating around the PC security program quick and easy. System Watcher – Protects PC against unknown threats and lets you roll back system changes made by malware. Kaspersky File Advisor – Allows user to check file safety with a single click of the mouse. Kaspersky URL Advisor – Marks web links with a color-coded tag to advise user of their danger level. Anti-Phishing module – Warns about phishing sites that steal personal data. Task Manager – Allows user to monitor malware scanning activities as they happen. Desktop gadget – Lets user see their computer’s security status instantly and gives them quick access to essential security settings inside Kaspersky Anti-Virus 2012. Kaspersky Internet Security 2012 and Kaspersky Antivirus 2012 are now available for free download with 30 days of fully functional trial at . 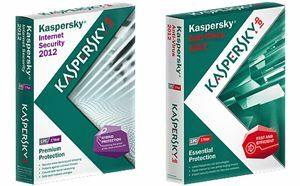 Kaspersky Internet Security 2012 and Kaspersky Antivirus 2012 are priced at USD59.95 and USD39.95 per year for one PC.